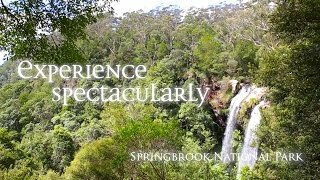 Natural Bridge is in the western part of Springbrook National Park, part of the Gondwana Rainforests of Australia World Heritage Area. The park's Natural Bridge section features a picturesque rock formation, formed by the force of the waterfall over the basalt cave. It is easily accessible from the Nerang-Murwillumbah Road car park. Start the short one kilometre subtropical circuit clockwise and descend through ancient Gondwana rainforest to the Natural Bridge rock arch. During the day spot paradise riflebirds, green catbirds, wompoo fruit-doves and also rare and threatened species like the cascade tree frog, tusked frog, sooty owl and koala. At night join a guided nocturnal tour to see the resident colony of protected glow-worms and microbats. On summer nights, also see luminous fungi and fireflies. Cave Creek in the Natural Bridge section is a restricted access area. Swimming in the creek, including within the cave, and access to the creek bank is prohibited.